As we drove up the road from Camp Verde, Arizona, we caught sight of an unusually beautiful house set into a hillside. "Do you think that's it?" I asked incredulously. How could a house made of old tires look like an adobe masterpiece? "It's it," said Mark as we drew closer. Heather Mauch and Tammy Day came out to meet us, and for the next two hours, we heard the remarkable story of how their Earthship made the journey from dream to reality. It started with an idea followed by lots of research. "We spent about a year reading everything we could about rammed-earth houses," said Heather, "And we studied a 'terradome' in Colorado. We chose this type of construction because it's based on the concept of thermal mass rather than insulation. The walls and floor act as a heat reservoir to warm the house in winter. In the summer, the mass works to keep the house cool." We followed Heather and Tammy through their hand-carved front door. Heather opened a door on the left side of the entry hall. "This is the power room," she said. "All our electricity is generated by the sun. Solar panels charge 24 12-volt deep-cycle batteries. We have a solar hot water collector outside, which gives us hot water in summer and preheats water going into our propane water heater in the winter." The power room also let us see the Earthship's building blocks. 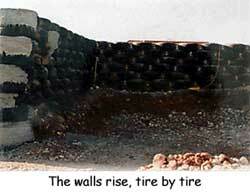 The weight-bearing walls are constructed of sedan-sized tires packed with about 300 pounds of earth each. The gaps are filled with aluminum cans, which are also used to take up space in interior walls. Leaving the power room, we entered the main part of the house, which has a wall of glass on the south side. The walls are finished with genuine adobe, which gives the interior a warm glow. The floor is stone, and every inch is beautiful. Heather and Tammy's house would be remarkable if they had hired designers and architects and contractors to build it. They didn't. They did everything they could themselves, which means that every single one of over 400 tires was packed by them. "One of us would fill, and the other would ram it into the tire with an eight-pound sledge hammer," said Tammy. "When we got tired, we'd switch." On a good day, they'd get 15 tires packed. "We had a five-year plan to get this house done," said Heather, "And we finished it in two." After 5,018 hours of work, they sat down to their first meal in their new home. Not only had they become experts at filling tires, they'd also mixed and poured concrete, "mudded" the interior walls with adobe, and completed all but 24% of the work on their house. "We had help when we needed it," they said, "And often our contractor would teach us how to do something and leave us to it. We learned a huge amount." We looked at the pictures of the construction process and marveled. "It took commitment," said Tammy. It also took vision, perseverance and strength. Building a rammed-earth home is not a project for the faint of heart. 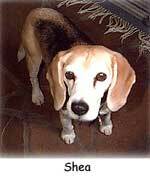 As we walked back down to the Phoenix, Heather and Tammy's beagle Shea ran with us to meet Marvin. "We really built this house for her, you know," said Heather. "This is her retirement home." Shea is one lucky dog. I looked back as we drove away. It's a jewel of a house, that Earthship, and an inspiration to anyone who needs to believe that dreams really do come true, especially if you're willing to put muscle behind them. Click here for more pictures of Heather & Tammy's Earthship during and after construction.